There are some pretty exciting Australian chefs on the London scene right now, eg, Shane Osborn (Pied a Terre), David Thompson (Nahm), Skye Gyngell (Petersham Nurseries). Another is Brett Graham, who after opening The Ledbury at the age of 26, became the youngest Australian to ever win a Michelin star. This January saw Brett earn his second star, an achievement further capped when his sideline venture, The Harwood Arms, also won its first star. But then, Brett has always been on a steady climb. After arriving in London in 2000, he became a winner of the Young Chef of the Year award just two years later. Before The Ledbury, his time in London was spent working his way up to senior sous chef at The Square under Philip Howard. For a two star restaurant, The Ledbury has one of the best value Sunday lunch menus around. Three courses from the a la carte menu costs only £40, with a similar menu in the evening being priced at £65. However, the only drawback of dining on Sundays (and Saturdays) is that Brett typically doesn’t cook during the weekends. Although, not having the head chef in action should, in principle, not make a difference. 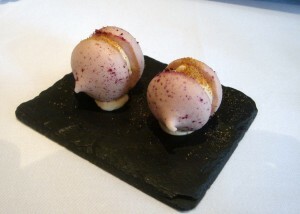 Amuse bouche was a pomegranate macaroon with foie gras parfait and ginger crumbs. 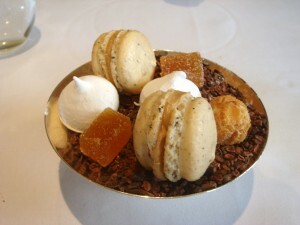 The parfait was creamy with the richness of the foie gras, and it married beautifully with the lightness of the macaroon. The touch of ginger added a nice zing to the combination. We started with flame grilled mackerel with cucumber, Celtic mustard and shiso dressing. 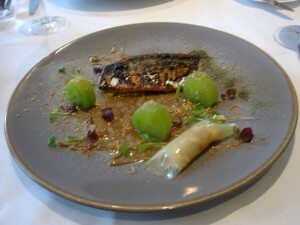 The mackerel was delightful and heady with the succulent deliciousness of the fish. The cucumber came in the form of a jelly wrapped around some unctuous smoked eel. The beautifully aromatic Shiso dressing and the touch of mustard completed the dish succinctly. This was a stunning course. 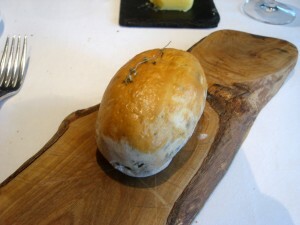 Another starter of celeriac baked in ash with wood sorrel, thyme, rosemary and sage was presented to the table in its uncut form before plating, ie, wrapped in the dough encasing the ash and herbs in which it was baked. Cooked beautifully, the celeriac was melt-in-your-mouth tender, but still firm in texture. The herbs lightly tinged the root vegetable with a fragrant aroma. It was served with a wild boar kromeski (braised, crumbed and deep fried) which was moist and tender. The dish was finished with truffle cream, some hazelnuts which added a lovely crunch, and a jus gras. 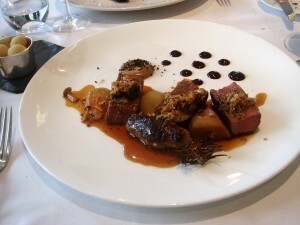 A main of Sika deer baked in hay with beetroot was incredibly succulent and tender. This was a fantastic cut of meat, stunning also for its intensity of flavour. It was accompanied by some malt puree, deer sausage and a wonderfully reduced deer jus which worked a magic. Best end of lamb and a 24-hour slow cooked lamb shoulder, garnished with some olive crumbs and chive flowers, were also very tasty. However it did not quite match the flavour sensation of the deer. A side of aubergine, caramelised to a delicate sweetness with black sugar and miso, was fantastic. A shame then, that our plates on both the mains were not quite hot enough, which meant our main courses were a little cooler than they should have been. Bread choices included wholegrain, which was hard and crusty, and an onion and bacon brioche which was to die for. The flavour of the bacon and onion permeated sweetly throughout the buttery brioche. To desserts, and a date and vanilla tart came with a sweet pastry of the highest order. 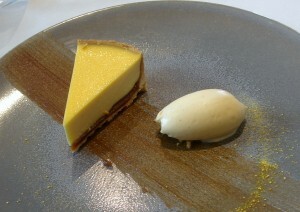 The tart was filled with a thin layer of date puree, and then set with a vanilla custard which was ever so slightly eggy. But otherwise, the contrast between the custard and the puree worked well together. The accompanying cardamom and orange ice cream was also a nice fixture. 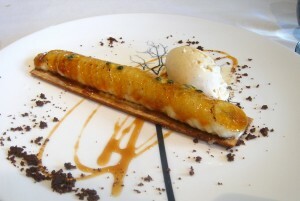 A caramelised banana galette consisted of sliced bananas perched on some crispy puff pastry. A wonderfully crunchy caramel coated the bananas. The galette was served with salted caramel, and peanut ice cream, a combination which is always irresistible. I enjoyed both these desserts – they were nice – but they didn’t excite me. I remember being far more enthralled with the desserts that I had the last time I came to The Ledbury for Sunday lunch (pre-blog). I found those far more complex and innovative, and at that point, the restaurant still only had one star. But this doesn’t take away from the fact that these desserts, on their own merit, were still very good. Petit fours consisted of a choice of white chocolate with apricot, Earl Grey macaroons, passion fruit jelly and marshmallows, all of which were nicely done. The service was fantastic and laid back. Our waiter was particularly charming and a little cheeky. It was nice to see some personality in a waiter at a two star restaurant! 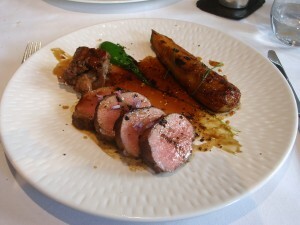 The food was wonderful, with the mackerel and the deer dishes being particularly inspiring. 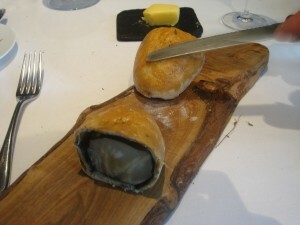 For £40, Sunday lunch at The Ledbury really is fantastic value, even if Brett isn’t usually there on Sundays. But knowing that he doesn’t typically work weekends means that if I were to go for dinner, I would rather go during the week – even though, in principle, it shouldn’t make a difference. Set lunch menu – £22.50 for two courses and £27.50 for three courses. 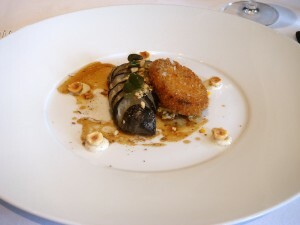 I just took my boyfriend for his birthday there on Monday, I really liked it too… especially the aubergine. I should have taken the deer instead of the John Dory, looks very good! So happy to hear you like my posts. Nice review. The celeriac looks and sounds fantastic! Interestingly, I was at The Square a few months back and found their desserts were not quite up to same standard as the other dishes we were served. I was here a couple of saturdays ago and brett graham was in the kitchen. The dishes looked much the same as yours. Hi Nordic, Yes I wonder why that is with the desserts? Hey Lizzie, great. you got lucky! I was told Brett’s partner works a usual day job so Brett tends to not cook weekends if he can help it. But I guess he has to sometimes come in. But its good to know that the Sunday lunch are meeting his usual standards. I went and tried their set lunch on a Saturday which was £27.50 for 3 courses but the options were much more limited. We saw quite a lot of other tables having the celeriac and wondered what the fuss was about but we didn’t get to try. Maybe next time.